Nokia has unveiled the Lumia 930, its new flagship smartphone that'll launch with Windows Phone 8.1 straight out of the box. It also comes sporting a 5-inch Full HD display as well as wireless charging built-in and a 20MP camera. In order to push the new features of the 930 Nokia will be offering a free wireless charger with every Lumia 930, plus if you pre-order you'll also get another one and a Bluetooth speaker free as well. The Lumia 930 is a Europe-focused version of Nokia's previously launched Lumia Icon which has become Nokia's US-only flagship smartphone. Why wait so long to launch it here? Well Nokia's touting the arrival of Windows Phone 8.1 as the only reason so they can release it with the new software out of the box. Where the Lumia 930 differs from its American sibling is in the colour choices as the Lumia 930 comes not only in Black and White but also in Green and Orange. This is Nokia's most-powerful smartphone yet packing a 2.2GHz Snapdragon 800 quad-core processor, 2GB of RAM as well as 32GB of onboard memory. On the back you'll find a 20MP Carl Zeiss lens that comes with all the Creative Studio features you can get on the Lumia 1020. One of the biggest selling points however will be the chance to get first-access to Windows Phone 8.1 - Microsoft's first major update for Windows Phone 8. Leading the list of new features is Action Centre - a pull down menu that shows quick settings as well as notifications and gives quick access to the full settings menu. Next up is the ability to change the background colour of tiles to any image - once set the image is overlayed onto the tiles with the tiles moving over the top of the image. Finally Microsoft has updated the calendar to now include a more complete 'Week View' that lets you see events throughout the week all on one screen. Finally, Nokia unveiled the Lumia 635, a budget 4G smartphone that boasts a lower-resolution 4.5-inch ClearBlack display but does feature a 1.2GHz quad-core processor. As with all Lumia smartphones the Lumia will be launching with Windows Phone 8.1 which means you'll get all the new software features that are heading to the 930. The Lumia 635 has a replaceable shell on the back and, for the first time, has the menu icons actually on the screen rather than as soft keys located below the display. The Lumia 635 will be arriving in May whilst the 930 has a release date of June/July. Nokia's remaining tight-lipped about pricing however as soon as we know we'll update this piece. Armed with iris scanners, Microsoft means business. 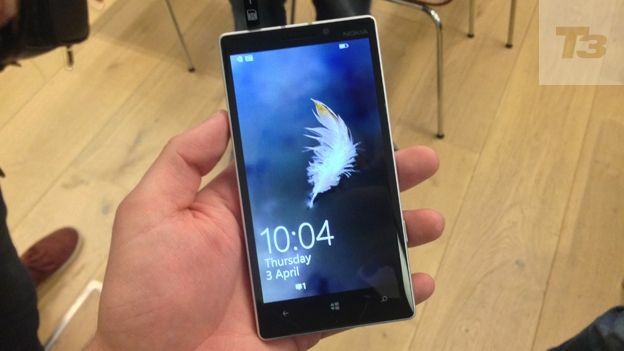 Is the Lumia 830 just a mini version of the 930 and how do they compare?